179). The disadvantage of this method of fixing is that cracks are liable to occur round the edges of the soldered dot. 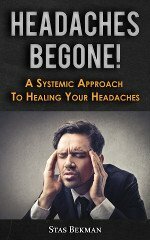 The Secret Tack. A better method of fixing dormer cheeks is shown by Fig. 180. This is formed by hollowing out the boarding and soldering a lead tack or copper clip to the back of the lead covering. The loose end is passed through a slot in the boarding, and copper nailed on the inside. This secures the lead as firmly as the soldered dot, and is not so unsightly. These may be executed in either iron or lead. 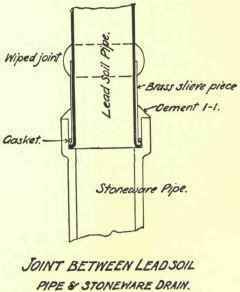 Lead soil pipes are durable, easily cleaned, and less corrosive than iron; their wiped soldered joints (Fig. 181) are more reliable than the caulked leaded joints of cast-iron pipes, and there are fewer joints in lead than in iron pipes. The joints in soil pipes should be "wiped." This operation is performed by opening the upper end of the lead pipe by means of a tan pin, when the end of the remaining piece is filed to a sharp edge on the external face, the pipes are then fitted together and the internal faces kept true. The two ends are covered with "soil" for about 3 inches from the extremities, and the pipes for about 1 1/2 inch from each end are scraped bright by a shave hook. The pipes are then placed together and secured in position, molten solder being poured on from a ladle and wiped round to shape with a greased cloth. The solder adheres to the part that has been shaved, and forms a sharp line at its junction near the soil (see Fig. 181). 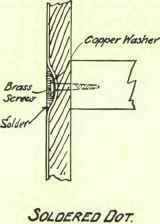 Plumber's solder is composed of three parts, by weight, of lead to one part of tin. To prevent sagging or telescoping, lead soil pipes are supported every 5 feet by a pair of tacks soldered to the soil pipe and securely nailed to the walls. Lead soil pipes can be obtained tinned inside. The tinning, however, is liable to chip and present a rough surface to collect foul matter. Fig. 182 shows the connection of a lead soil pipe with the drain. A brass or gun-metal sleeve piece or thimble is threaded on to the end of the pipe, and the lead is bossed over the projecting fillet of the thimble. The top part of the thimble is secured to the soil pipe by a wiped joint. The thimble is then placed in the drain socket, and the joint made with Portland cement 1 to 1. Soil pipes should be continued up full bore as ventilators, and protected as stated in the Chapter on Drainage. These are generally of lead, and vary in sizes from 1 1/2 to 3 inches. 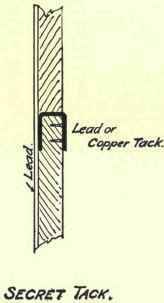 They are secured to the wall by lead tacks, and connected to the drains in a similar manner to the soil pipes, except when discharging over an open channel. Iron soil pipes are generally used at the present time on account of their strength, as they stand expansion and contraction better than lead. No iron soil pipe should be less than 1/4 inch thick for outside situations, and joints should not be made in the walls. Iron soil pipes have more joints than lead pipes have, the former being cast in 6-feet lengths, whilst the latter are made in lengths of from 10 to 12 feet. The pipes should be fixed clear of the wall - by being nailed through lugs which are cast on the pipes, or they should be secured by wrought-iron collars, the back part of which is built into the wall, and then the two parts are screwed together. Iron soil pipes are finished at the top in the same manner as lead pipes, and the joint connecting them to the drain is made by first placing a ring of spun yarn, or a lead flange cut to fit, inside the socket of the stoneware pipe. The beaded spigot is then inserted into the drain pipe, and the joint made in cement 1 to 1. In modern practice sink, bath, and lavatory wastes are executed in iron, as there is less expansion and contraction by the hot and cold water. They are secured to the wall and connected to the drains in a similar manner to the soil pipes. Should the bath waste be clear of windows it can be discharged into a cast-iron hopper head, and so conducted to the gulley. If, however, it is near windows, it should be connected to the junction of the cast-iron pipe, and then that pipe continued up above the eaves as a vent, the bottom end discharging over a gulley or into a slipper, as before stated.